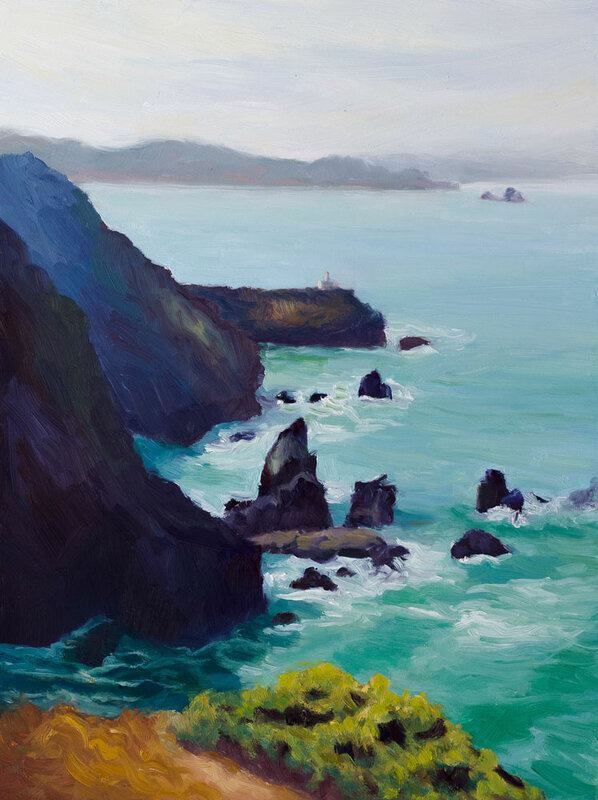 Point Bonita #3, Oil on Gessobord Panel, 12x9"
After I did the watercolors I posted yesterday, I set up the sketch, the watercolor and my iPad displaying the photo on the table beside my easel and painted the scene once again, this time with oil paint. After a month or two of being totally frustrated with oil painting, trashing everything I made and about ready to give it up, suddenly painting was easy and I was loving it! The entire painting worked like a charm except the foreground mount of dirt and ice plant which was the last thing I painted and which I did over and over. It kept trying to call too much attention to itself. I think I finally successfully muted that foreground while still keeping the light on it. Then I was looking at some delightfully free and vibrant oil pastel work on Aletha Kuschan’s blog which inspired me to try the scene in oil pastels too. I know nothing about oil pastels so I quickly read a few how-to’s on the web and dug in. BUT before I show you the drawing, I have to say that I made a fatal misstep: I chose a sheet of the totally wrong paper to work on. Instead of starting small on a sheet of white or blue pastel paper, I chose a large sheet of brown Stonehenge drawing paper. What was I thinking? Brown under a turquoise sea? 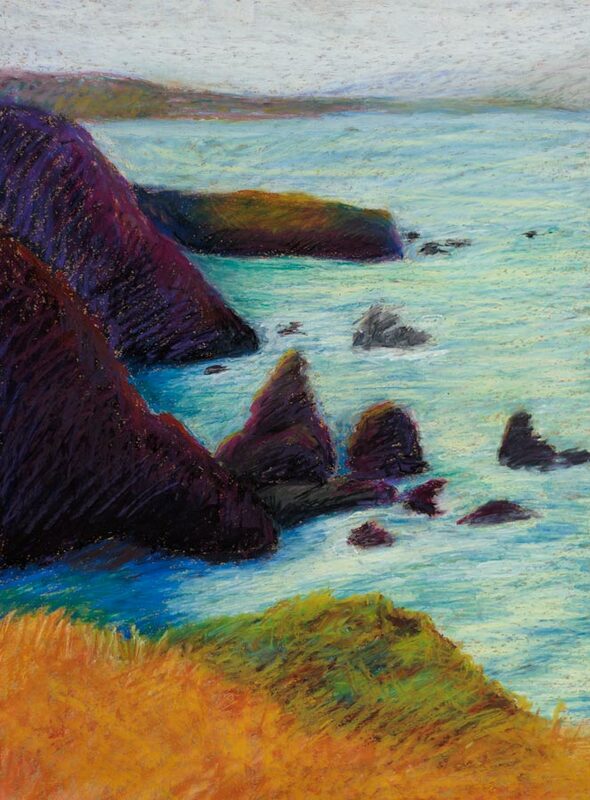 Point Bonita #4, Oil pastel on Stonehenge paper, 17x13"
It was impossible to cover all the brown paper because even though the oil pastels got really thick in some areas—so thick that no more could be applied—in other spots they just wouldn’t cover. Although my Holbein Oil Pastels are very old, purchased for a small project I did more than 20 years ago, they were still in good shape. But I didn’t have the right colors, and I had trouble blending. I didn’t have blending stumps, didn’t want to use my fingers and was wearing gloves which didn’t work. I tried a paper towel but it just smeared and left paper towel lint. Compared to paint, oil pastels seems like a lot of extra work, having to fill in so much area by scribbling over and over. And it was messy; my gloves and the pastels got dirty from colors transferring onto them. But maybe if I knew what I was doing, or had used the right paper it would have been easier or less messy? (Not to say that oil painting isn’t messy! Everything I own has paint on it!) I like the look of oil pastels done well so I’ll try another experiment with them. But on the right paper this time! Any tips? I love seeing all these approaches. Different media, but they all still say Jana! 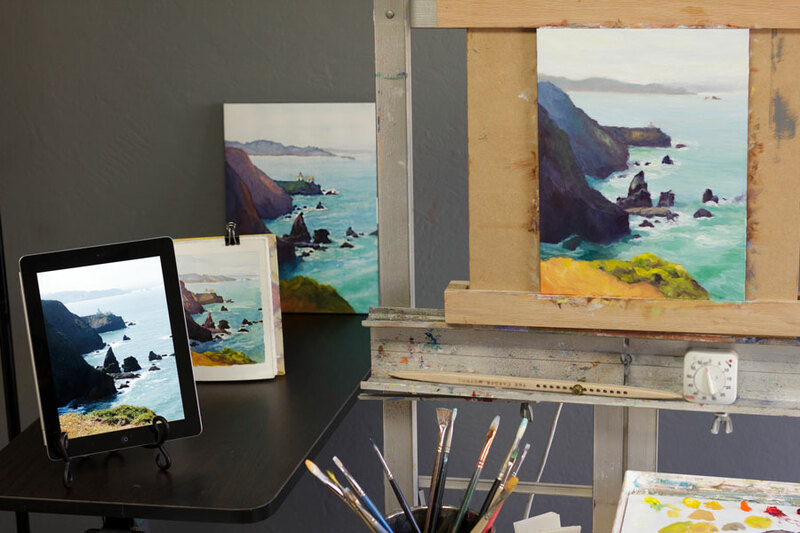 I thinking the foreground in the oil is just right, and it’s a lovely painting. I love these 3 versions of Pt. Bonita, but I especially like the oil pastel version. Oil pastels are dear to my heart. I have struggled to find colors that are subtle but in brands that have a good texture. That is all personal. I usually use Stonehenge printmaking paper with a coat of Pastel prime or Liquitex Clear Gesso. This gives the pastel something to grab onto so it won’t slime over the paper. Also, I will always do a complementary underpainting in oil or in acrylic. Those little “skips” in the pastel allow the underpainting to sparkle through. So I don’t do very much blending, but I have found that when I need to, old worn out oil painting brushes will work better than blending stumps. Also, I have broken the brush and ferrule off old brushes and run the broken end through a pencil sharpener. This gives a whole different effect where you scratch through the texture of the built up pigment. Not sure if you are still using oil pastels, but had to let you know my experience. I like your work very much. All the best.